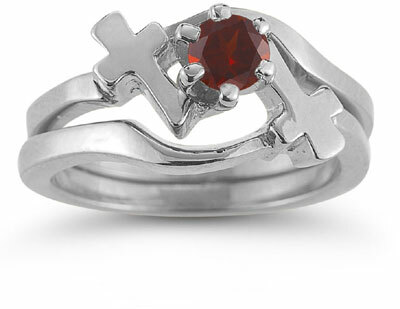 The Garnet Cross Purity Wedding Ring Bridal Set holds a commanding crimson garnet at its center, secured in a six-point setting that is safely guarded by two crosses attached on either side by white gold bands. This symbolic design sends a strong message to renew and inspire commitment to faith and love. At the top of the ring sits a 5mm garnet gem that easily absorbs the light's rich red hues with a hint of fire underneath. The stone is able to capture maximum light from its setting high up on the base and is bordered on each side by two solid gold crosses that invoke memories of heirloom rosary beads. Each of the crosses lead the way to two 14k white gold bands (each 2mm wide) that wrap around the finger and join at the back of the ring in tight unison. This wedding ring offers an original bridal set based on symbolic imagery and traditional design. It is an endearing gift for any bride and a ring to be enjoyed for years to come. We guarantee our Garnet Cross Christian Wedding Ring Bridal Ring Set, 14K White Gold to be high quality, authentic jewelry, as described above.